Big or small, everyday or exotic, our lush green plants will deliver endless smiles to friends and family for months to come. Beautifully housed in one-of-a-kind containers, they also bring an energy and vibrancy into any home or office. 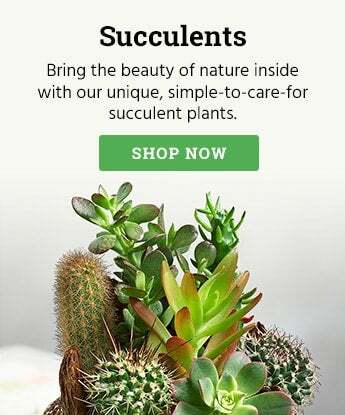 As natural presents become more and more popular, giving the gift of living plants is appreciated around the globe. Fresh green plants are the perfect way to say everything from 'thank you' to 'congratulations'. If you are ready to send a gift, then think green! When selecting a thriving green plant, 1-800-FLOWERS.COM® can help you send the best plant for the occasion. Choose from a variety of floor plants, tabletop plants, bonsai, or bamboo that will all add the perfect amount of green to any room. If you are searching for a long-lasting gift they are sure to remember, a growing floor plant is the right gift for you! Floor plants often become a centerpiece in any home or office, so choose a decorative pot that best suits their taste. From money trees to lush green plants to cactus, a tabletop basket or potted plant can make the perfect gift. Saying 'happy birthday' or 'get well soon' is simple whether they live near or far. Bonsai are a sophisticated and elegant gift suitable for anyone on your list. The art of trimming or maintaining a bonsai is a simple and easy process that your closet friends and family members will enjoy. Bamboo is traditionally a symbol of luck and an appreciated gift for any occasion. Do you have a colleague starting a new job? Consider sending a lucky bamboo as a sincere expression of your best wishes and future success.